Hosted by the Volusia Region AACA. B eautiful location in Lake Helen's Blake Park - plenty of shade, a large covered pavilion, music by Laurie, Queen Of The Hop, great food, awards & cash prizes, (including 15 $50 bills). Open to all makes & models. Pre-registration is $15 by April 6. Registration form HERE. Proceeds will benefit John Hopkins Children's Hospital. 28 trophies and $250 prize to the best club participation. Gift basket raffles, 50/50, music and food and drink available for purchase. This event is the newest Concours in North America and will feature the following marques and special classes among others: Studebaker, German Engineering, American Classics, and zdditional features to be announced soon. The Concours event weekend kicks-off with an outdoor celebration at sunset on the lawn with the backdrop of beautiful Paynes Prairie. Attendees are invited to bring their lawn chairs for an evening of music and entertainment. 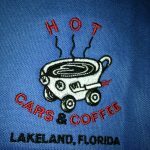 Saturday will be a 9-11am cars & coffee. Art exhibits will be scattered through out the automotive displays. There is a special kids area and vendors offering food and beverages. A Grand Gala, black tie affair, 6pm-midnight will featuring "The Voice" contestant Natascha Bessez and local talent Elio Piedra. Entry to the concert is limited to car entrants, VIP purchase, chairman's club purchase, sponsors and Gainesville country club members. Sunday is Concours Day with judging and awards. Every month on the fourth Saturday. Hosted and music by Lance's Cruzin to the Hop. Trophies, prizes, food and lots more. Enjoy Sommer's great breakfast buffet. Proceeds will benefit the Gary Sinise Foundation. Open to all years, makes and models. Special guest appearance by Richard Rawlings from Gas Monkey Garage and star of Discovery's Fast N' Loud. Trophies for Best of Show and People's Choice. Music by Tom's Traveling Tunes. This show is open to all vehicles, cars and trucks. The first 150 to register will get goody bag and dash plate. There will be 13 trophies + child's choice. So sign up early to get your dash plate. This show is a fundraiser for Sunshine State Superkids. Sunshine State Superkids is a FREE program for special needs children, under-privileged children and all other children. Sunshine State Superkids supplies all the cars, equipment, food and awards at the end of the day. SSS does 8 events a year through out the Central Florida area. Celebrate America's passion for the Automobile at the inaugural AAA Auto Expo in Heathrow/Lake Mary. Join us for fun and friendship and share your ride with other drivers who share your love of cars. Come check out cars you've loved - and cars you'd love to have - or bring your own classic car, sporty sedan, work in progress to put on display. Give-aways, free admission, display our car for free. First 250 drivers displaying their cars will receive a collectible event hat & sling pack goodie bag, while supplies last, plus commemorative dashboard plaques for all cars on display. Register to win a Royal Caribbean Cruise 5 night cruise. Flyer HERE. Open to all years muscle cars, exotics, special interest, classics and customs. Plus 1983 and older classics cars & trucks. 50/50 raffle, random drawings, and surprise giveaways. 3,917 free well lit paved parking space for participants and spectators. Trailers welcome. Cruiser registration opens at 4 pm, cruise at 8:30 pm. Ask how to be our "Featured Car Club of the Week". Host your car club event and meeting here. Open to all classic, custom, or cool. 10% discount inside the brewery for rides in show field. Food truck, MC/DJ Rockin Rich Bedford, LIVE broadcast on www.rollbackradio.com, $25 "Monks Gift Card" to managers choice near conclusion. Great crowds this past September and December. Free to attend. 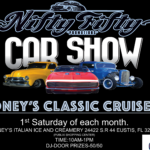 Hosted by the Skyway Corvette Club. This annual charity event gathering is at one of Florida's finest shopping and dining locations near beautiful Lido Beach. Limited to the first 175 Corvettes, so register early as it usually closed in early April. Registration includes an event polo shirt. Awards, 50/50, raffles and door prizes. Rain or shine. Hosted by Premium Productions. Open show with 31 classes, 2 Best of Shows for each class & 1 overall Best of Show in each class. Club participation winner receives $100 (10 member min). Music, vendors, food and drink available. Dash plaques to the first 75 registered. Registration 8-11am, judging begins 11am, awards around 2pm. Rain or shine. 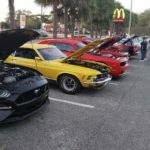 Hosted by The Mustang Club of Tampa and Bill Currie Ford. Proceeds will benefit Caring for Kids. Open to all years of Mustang and Ford products. Limited to 150 cars. No cars parked after 11am. Lunch will be provided by Tijuana Flat. People's choice voting plus sponsor's choice and club participation awards. All vehicles on show field must be registered and no canopies or for sale signs allowed. All cars must remain in place until after awards are presented. Vendor spaces are available. Spectators are free. About our charity: Care Beyond Cost... Shriners Hospitals for Children are committed to providing the best care for children in their specialty areas of Orthopedics, Burn Care, Spinal Cord Injury, and Cleft Lip and Cleft Palate, regardless of a family's ability to pay. Enjoy classic cars, the Flying Wallendas, great food and more. Hosted by the Volusia County Mopars. Open to all years, makes and models. The Dock Dogs and a food truck will be here, so bring the family and all the pets. Raffles from Diablosport, Powerhouse Hp Tunes, Chick-fil-A and PETCO. Every month on the first Saturday. Hosted by Nifty Fifty Promotions. Show off your classic, muscle, or street rod at Coney's. This will be a fun family event so bring the kids down for an ice cream. There will be music from the 50's-60's- 70's and country to enjoy. Every month on the first Saturday. Open to all years, makes and models of cars and trucks. Trophies including club participation and manager's choice awards. 50/50, door prizes, music and 10% discount cards at Quaker Steak for registered vehicles. All donations from the raffles will go to the Wildlife and Rescue Rehabilitation. A 600 pound tiger and an owl will be on display. Please call for vendor information. Every month on the first Saturday. Open to all classic, custom, or cool. 10% discount, great parking and foot traffic. $25 gift card near conclusion for managers choice. Music by MC/DJ Rockin Rich Bedford. Every month on the first Saturday (except June, July & August). Open to all classic cars with parking available for newer specialty cars. Shops and restaurants will be open throughout the event. Parking will be available in the main street through town and around the historic Pasco County courthouse. Truck show, drag racing, burnout contest, SPL audio contest and bikini contest. Trophies to the top 20 Best of Show plus select specialty awards. Show registration is $40 pre & $60 day of show. Racing registration is $25. Spectators are $20 (kids 10 & under are free). Every month on the first Saturday. Dearborn Street in historic downtown. 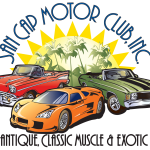 Open to all street rods, classics, antiques, muscle cars, even a dragster or two. No trophies, awards, or registration fees. DJ, door prizes, and raffle. Shops and restaurants are open for your convenience. Cash awards: $500 for 1st place, $250 for 2nd place, $100 for 3rd place. Goody bags to the first 70 cars. Door prizes and 20% off Packy's food and beverages for car show owners. Music by Rockin Rich.